It’s a very prolife kind of weekend, especially in Washington, DC. My 23 year old daughter is there for the first time. She’s wanted to go for a long time. A group of her college friends from Ave Maria University made the trip from Naples yesterday morning. If you see a group on tv in red sweatshirts it might be them. 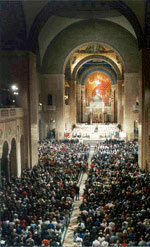 There will be a vigil Mass again this year at the Basilica of of the National Shrine of the Immaculate Conception. This picture is from last year’s Mass and can be found on the U. S. Conference of Catholic Bishops website. The Mass will be this evening at 8pm est. with Cardinal William Keeler celebrating and giving the homily. You can see a pdf file of some of the activies taking place this weekend here. EWTN will be featuring live coverage beginning tomorrow. Help them to see that the child they carry is made in Your image – as well as theirs – made for eternal life.